Euthanasia performed without the consent of a competent person. 1. A radiometric term for the rate at which radiant energy is transferred across a unit area of a surface, commonly measured in watts per square meter. 2. A radiometric term for the rate at which radiant energy in a radiation field is transferred across a unit area of a surface (real or imaginary) in a hemisphere of directions. In general, irradiance depends on the orientation of a surface. The radiant energy may be confined to a narrow range of frequencies (spectral or monochromatic irradiance which is characterized by a single frequency) or integrated over a broad range of frequencies. Irradiating, shining, or illuminating; as, the irradiant moon. 1. To expose someone to or to treat something with radiation or streams of particles. 2. To treat food with electromagnetic radiation or to kill microorganisms and slow down the process of ripening and gradual deterioration or rotting. 3. To make something brighter by shining light onto it. 4. To make something intellectually clear. 5. Etymology: "to cast beams of light upon"; from Latin irradiatus, irradiare, "to shine forth"; from in-, "into, in" + radiare, "to shine". 1. To go out in a direct line from a central point or area: Spokes radiate outward from the middle points of the bicycle wheels. 2. To give out, to transmit, or to spread around: The sun radiates light and heat; however, they are reduced when it is cloudy. Warmth was radiating from Tom's fireplace which made him and his family much more comfortable during the winter. 3. 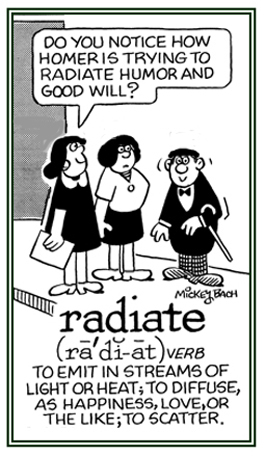 Etymology: from Latin radiare, "to beam, to shine." © ALL rights are reserved. Relating to the detection of and diagnosing of a disease by the passing of one's hands over a body: The radiesthesic skills of the renowned teacher, Mr. Cooke, were well-known and often discussed by his disciples. An image recorded on a photographic film or plate produced by the radiation emitted from a specimen; such as, a section of tissue, that has been treated or injected with a radioactively labeled isotope or which has absorbed or ingested such an isotope. An expert in radiobiology or the branch of science concerned with effects of light and of ultraviolet and ionizing radiations on living tissues or organisms.